As fall arrives, and with school back in session, women’s groups at churches are revving up for “Bible studies.” If they are Southern Baptist or are otherwise prone to utilize the spiritually dangerous wares from Lifeway, one of the prevalent “teachers” being promoted is Priscilla Shirer. 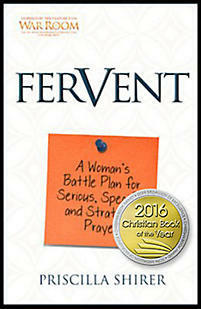 This is not a review of Armor of God or Fervent, either the books or the related curricula. You can find more on Shirer HERE, HERE, HERE, HERE, and HERE. For more Pulpit & Pen posts on Shirer, go HERE. If you are in a church that will, this fall, promote Shirer’s curricula for women’s “Bible” studies, know this: it is evidence that the pastor and leadership of that church do not practice Biblically-commanded discernment. (1 John 4:1, Philippians 1:9-10, Colossians 2:8, 1 Timothy 6:3-5, Romans 12:2, Romans 16:17-18) They are not “contending” for the “sound doctrine” (2 Timothy 4:3) of the faith. They are yielding, rather, to the popular embrace that bestselling authors tend to garner. But “best” doesn’t mean it is “best” for edifying your soul, “best” for teaching sound Biblical truth, or “best” for providing valid Scriptural encouragement. It’s “best” because it’s selling. Popularity, however, is no gauge for soundness. Jesus, you may recall, was not a particularly popular fellow when He trod the dusty trails of 1st century Galilee. 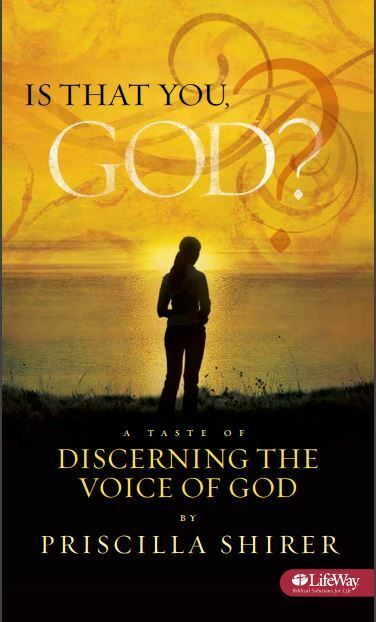 In 2009, LifeWay Press, the publishing and retail arm affiliated with the Southern Baptist Convention, published Shirer’s booklet, Is That You God? A Taste of Discerning The Voice of God. It should not require a pastor, or a Bible-imbibing believer, to go much farther than the introduction of this booklet to recognize the spiritual peril Shirer represents. While not negating Scripture, what Shirer does is a common enough practice acceptable in charismatic, prosperity gospel circles, but is thoroughly disdained by orthodox, Biblical Christianity. She promotes extra-biblical revelation. While her premise seems innocuously agreeable – disregarding the hint of the dangerous “God is love and nothing else” theology – Shirer goes beyond the bounds of Scripture by emphasizing that God will speak to you personally, privately, and specifically. But there is no Scripture that teaches this mystical “it’s all about me” mode of divine interaction. The Holy Spirit never points a believer to the Holy Spirit. The Holy Spirit always points the believer to Jesus in the Word. Now ...right this moment … you or I can randomly turn on “Christian” television and probably quickly find cosmetically-gifted, finely dressed charlatans proclaiming – with specificity – the “word of the Lord.” A poor fellow in Detroit with a cyst on his left lower lung will be healed. The Lord told the charlatan, you see. It’s common enough that this nonsense sadly passes as “Christianity.” But it’s also clear enough to be easily recognized – by the authentic believer – as diabolical. God does not work this way. Neither does He operate as Shirer suggests, with “specific revelation” to guide her. It’s wide path charlatanry that sounds appealing … and sells … to the undiscerning. This is Scripture-twisting deception. Christ’s references to “hearing” or “seeing” refer not to apprehending the personal revelation of God’s voice, but the personal understanding of God’s message in His Word. Christ Himself used parables so that “seeing they may not perceive.” (Mark 4:12) Meaning – understanding what Scripture means by what it says – is revealed to the believer. Paul speaks about the prevalence of “zeal” without understanding. “For I bear witness that they have a zeal for God, but not according to knowledge.” (Romans 10:2) And guess where you get that “knowledge?” Right. Scripture. Zeal? Worthless without it. You shouldn’t need fireworks, warning tocsins or “danger ahead” alarms going off to catch the extra-biblical emphasis of Shirer in this statement. Clearly, if your pastor and church tolerate someone who touts this as complicit with Christian faith, you have evidence that reliance on Scripture as the supreme authority for the believer is a secondary concern. “Examine yourself, to see if you are in the faith” (2 Corinthians 13:5) would be the appropriate response. Shirer completes her introduction with a soothing, almost-sounds-Biblical appeal. Tah-dah. There you have, in a nutshell, Shirer’s summary statement of her heresy-rich teaching. It’s called contemplative prayer and it is an ever-increasingly popular false form of faith. In order to engage in this, Shirer encourages readers to “lay aside the doubts,” which, of course, means lay aside the Bible. As though Shirer’s preference for extra-biblical heresy wasn’t evident enough from her introduction, a few pages into chapter one, she removes any doubt by glowingly citing perhaps the preeminent proponent of contemplative spirituality. Like Shirer, Dallas Willard is a wolf. His works emphasize contemplative prayer, subjective spiritualism, and techniques drawn from paganism, Roman Catholicism, eastern philosophy, and new age methodologies. Slathered with ill-used Scripture, these techniques have become “Christianized” and are increasingly accepted as correct disciplines for the Christian faith. While they are not remotely Christian teachings, they have deceived many … all the while the enemy laughs at the lack of discernment. But Shirer confirms her alignment with Willard’s false teaching. Uh, nope. No. This is pure pagan mysticism. God has spoken in His Word and, apart from it, not in your head or your heart. In response to Shirer’s emphasis on her spiritual “inner voice” – one that is completely absent in the teaching of Scripture (Paul instructed Timothy to “preach the word,” not to share what his inner, spiritual ear was hearing) – and her eagerness to abandon Scripture as sufficient, consider this observation from a giant of answered prayer from the halls of faithful Christendom. Nowhere does Scripture teach that the believer should go outside of Scripture for faithful guidance from God. One of the reasons we have “hidden your Word in my heart” (Psalm 119:11) is because the Holy Spirit uses that Word to bolster us in moments of temptation and to encourage us in moments of doubt. God has clearly, definitively, and sufficiently revealed His truth to us in His Word. What believers often miss is the little word “every” from this verse. “Every word” serves as the spiritual sustenance from which our life of faith is nourished. And “every word” is found exclusively IN the Word, the Bible. It is a certainty that neither Shirer nor any authentic believer has fully comprehended “every word” that has come from “the mouth of God” in Holy Scripture. And it is an equal certainty that no other “words” are forthcoming from the mystical experiences Shirer promotes. The current appeal for mystical, spiritualized, esoteric faith is perhaps unparalleled in Christian history. But its eager reception by undiscerning churches, pastors, and lay leaders poses authentic jeopardy for the believer. While the authentic believer is assured of salvation, the remaining option for the enemy is to thwart, frustrate, and nullify our effectiveness. If our faith is wrecked (1 Timothy 1:19) and we become useless to the Lord through the embrace of unsound teaching, the enemy has shut down a believer who should be a valiant voice for truth in an otherwise darkening world. The teaching of contemplative spirituality, as Shirer promotes, is a powerful, popular, diabolical weapon to frustrate authentic Biblical faith. This fall, you might be able to gauge the concern for the edification of your soul by your church and its leadership by the Bible studies it will offer to you. If Priscilla Shirer is among them, know this … you’re being given a clue that it disregards discernment and implicitly supports extra-biblical revelation. It willingly embraces teaching not founded on the “knowledge of him who called us” as revealed to us in the Word. In fact, it will be tolerating something quite contrary to that Word. Though such “woman” pleasing curricula may be acceptable to undiscerning churches, the question is, is it acceptable to you? Previous story Ed Young Rightfully Divides and Exposits a…Yo-Yo Performance?